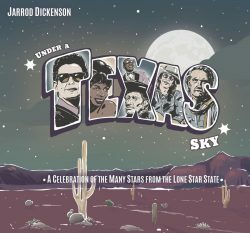 ‘Under a Texas Sky’ is Jarrod Dickenson’s first set of new songs since the highly-rated ‘Ready the Horses’ in 2017. Thanks to a relentless touring schedule and multiple festival appearances in 2018, Dickenson’s soulful Americana, infused with blues and country influences, has been building a solid fan-base here in the UK. The Texan troubadour’s new EP pays homage to some of the fine artists hailing from Dickenson’s Texan home. In the first of a series of planned releases, Dickenson has been inspired by the likes of Guy Clark, Willie Nelson and Doug Sahm, taking their original songs and then re-imagining them in his own distinctive style. The opening track, and lead single, is a cover of the much-loved Roy Orbison song ‘Uptown’; full of swagger and sway, it’s an inspired choice and lends itself to upbeat live performance. Dickenson’s warm singing voice is given depth by the excellent, echoing backing vocals. The lively rhythm and melody capture the same upbeat vibe as the original, sung from the perspective of a poor boy dreaming of a life of luxury and being noticed by a girl who would never look his way. The follow-up, ‘Try Me’, is a slow, languid song about desire and the almost desperate need to be loved. Initially, the almost-whispered vocal is open and vulnerable, building through the song into a passionate plea, mirrored by the bluesy solo and rhythmic keys, climaxing in a long, atmospheric outro. Again, the repeating backing vocals add texture. The 1966 original, sung by Esther Phillips, is a gloriously soulful number and another outstanding selection. Troubled singer, Phillips, had a string of Billboard R & B hits in the early 1950s, then faded, before making a comeback in the 1960s and, ultimately, earning four Grammy nominations towards the end of her career. Dickenson’s emotional performance does justice to the challenging source material. ‘Seven Spanish Angels’, the duet from Willie Nelson and Ray Charles, starts with an emotive, melodic vocal and a gentle instrumental backing eases into the song. It’s a narrative country tale of an outlaw on the run with his lover: “They could hear the riders coming / He said, ‘This is my last fight / If they take me back to Texas / They won’t take me back alive.’” After each lover’s inevitable death, a chorus of angels – introduced with uplifting backing vocals – gathers to pray and: “…take another angel home.” The song has been covered many times, including by Chris Stapleton and Dwight Yoakam live at the 2016 CMA Awards, and is certainly worthy of inclusion here. Dickenson’s version would sit comfortably amongst his own story-telling songs. The Doug Sahm song, ‘I’m Glad for Your Sake’, first recorded with the Sir Douglas Quintet in the 1960s, is up next. It’s upbeat and Dickenson’s delivery is smooth and jazzy, full of bittersweet longing. The final song on the EP offers a contrasting mood. ‘Dublin Blues’, from the 1995 Guy Clark album of the same name, is similar to the original, but with Dickenson’s low, understated singing over a gentle strum, it is a highlight of the record. Clark has a huge back catalogue to choose from, including many songs penned for other artists, such as The Highwaymen, Vince Gill and Alan Jackson. This selection links in well with the Texan theme: “I wish I was in Austin / In a chilly parlour bar / drinking Mad Dog Margaritas / And not caring where you are.” More importantly, the track suits Dickenson’s voice and sound perfectly. Jarrod Dickenson takes these songs and makes them his own. They are distinctively Jarrod Dickenson songs, arranged beautifully and well-performed, with his trademark warmly-melodic, single-malt vocal delivery. However, a covers project like this stands or falls on the selection of artists and songs. Some of them, like Willie Nelson and Guy Clark, choose themselves. But all of them are engaging and work together as if they were his own compositions. Bending Roy Orbison and Esther Phillips into his own Americana sound works effectively and there is further pleasure in following the trail back through the original performers. It will be fascinating to see where this project goes and how it influences Dickenson’s own songs in the future.